Caption slip reads: "Photographer: Swaim. Date: 1958-12-31. Reporter: Swaim. Assignment: Iowa awards. 11: Gov. Herschel C. Loveless of Iowa speaking at Iowa picnic where distinguished Iowans received 'Osc-ear' awards in field of education and arts. 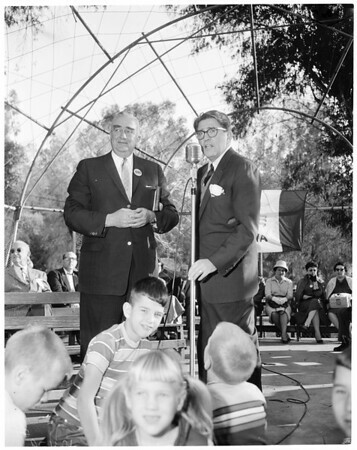 12: Superior Judge Frank Swain, ex- Iowan, presenting award to Virgil M. Hancher, pres. of Univ. of Iowa. 13: Carl Geiser, ex-Iowan, presenting award to L.D. Hotchkiss, ex-editor, ex-Iowan. 14: William Larrabee, immed. past president of S.C. Iowa Society, presenting award to Meredith Willson, conductor-composer, ex-Iowan".